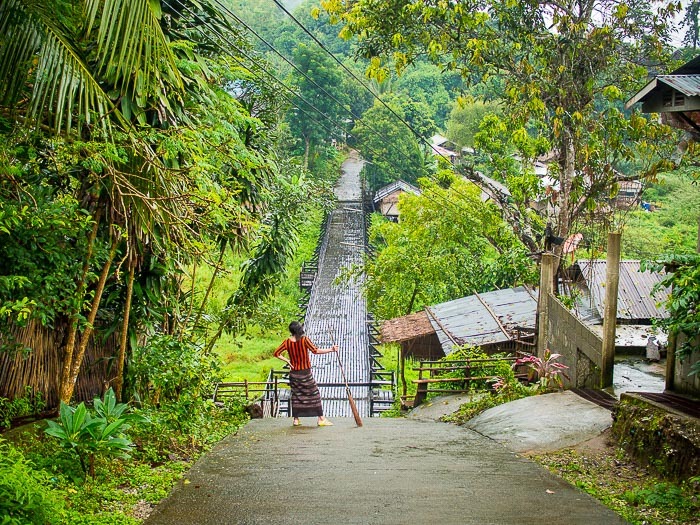 A subtle hint of red with this Burmese woman sweeping the street in front of her home in the jungle in western Thailand. One of the reasons I think this picture works is that red and green play off each other so well. This picture would not have worked if the blouse had been blue or yellow. I'm a part of a group of photographers who meets regularly in Bangkok. We enjoy a good meal, talk about photography and make a group assignment - something we're supposed to photograph in the coming month. This time around the assignment was "Red." 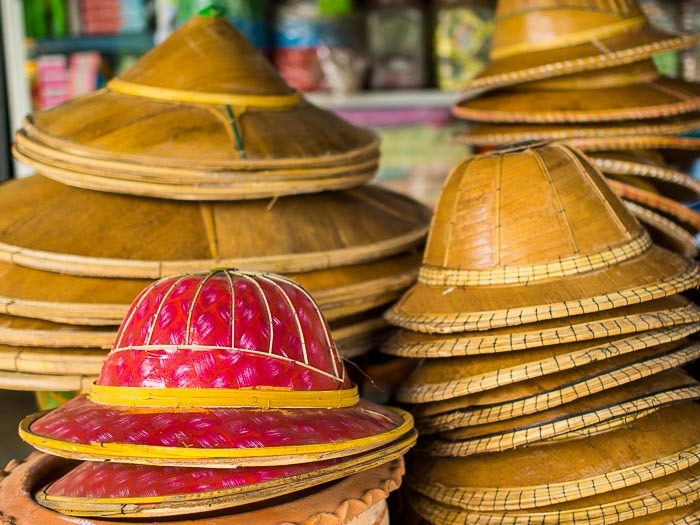 Burmese hats for sale in a market in Sangkhla Buri, Thailand. I was lucky that there was one red hat on top of a stack of bamboo colored ones. The challenge on an assignment like this is not to photograph red, but to make an interesting photo of red. Red doesn't even have to be the dominant color - because it elicits such strong emotions, just a tiny bit of red in the frame can have a profound affect on your picture. Think of the little girl in red in Steven Spielberg's otherwise black and white film "Schindler's List." 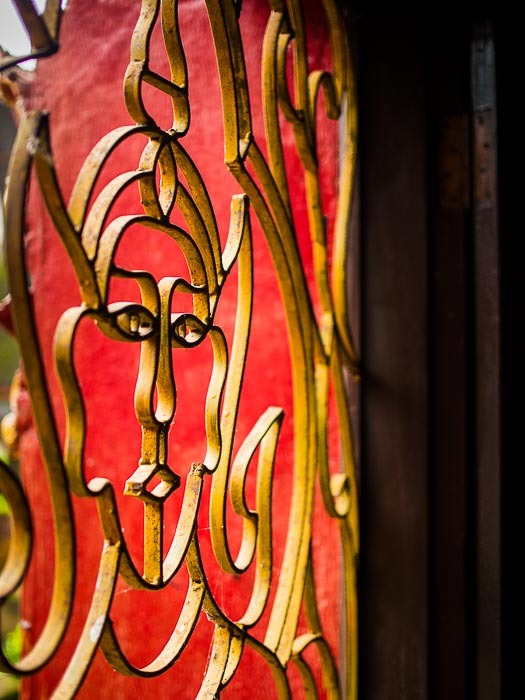 A window in a Burmese temple near Sangkhla Buri. The window shutter was a brilliant red. I didn't go up to Sangkhla Buri to photograph red. I was working on a story about a bridge up there. I spent a morning wandering around in the Mon community and I was seeing red everywhere I turned. Not usually in a big way, but in lots of little ways, like the hat at the top of this post or the woman sweeping the bridge. It certainly helped that red is such a powerful color. Even in the photo of the hats, where the dominant color sort of an earth tone bamboo, which has red in it, the red in the hat on the left really pops. Red is to color photography what garlic is to chicken - it always makes it better. But you have to be careful not to use too much or it completely overwhelms the photo. Nothing subtle about this. 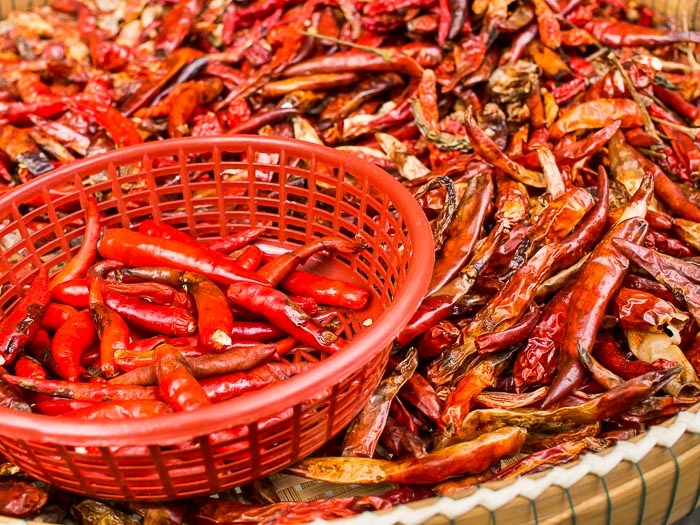 Red chilies in a red basket on top of a pile of red chilies. Probably too much red.